In Japan, as elsewhere, the pictorial and conceptual traditions of painting were a mixed blessing to photography, especially after photographers in that country acquired the Japanese equivalent of Beaux Arts ambitions. The problem in Japan was perhaps even more knotty than it was in the West, for in some ways photography can more easily manage a superficial imitation of Hokusai than of Constable. Thus, Japanese photography before the Second World War was for the most part identified with broad and simple graphic patterns representing a landscape that was a closed aesthetic issue long before Commodore Perry's visit in 1853. 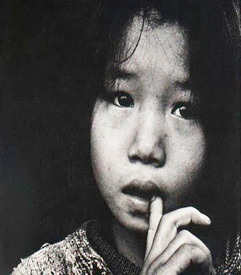 Ken Domon broke away from this romantic convention, and demonstrated that a clear depiction of the pertinent facts could be more challenging, and more surprising, than another mountain view in the mist. It is worth nothing that he developed his realistic and contemporary approach in photographing the sculpture and temples of old Japan. 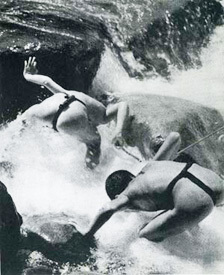 Students of traditional Japanese art will know this aspect of his work, which has remained the central and abiding preoccupation of his photographic life. These pictures are distinguished by poise, precision, a sense of judicious objectivity, and a complete absence of pictorial rhetoric. They persuade us that we are seeing the works themselves rather than a translation of them into photographs, although this is of course a deception. 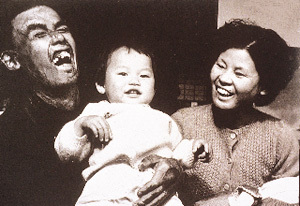 In 1957 Domon was moved to visit Hiroshima in order to photograph that city's survivors. He is said to have worked there with his characteristic deliberation, method, and systematic selflessness, as he photographed the advanced skin-grafting techniques, the lives of the damaged families, and the games of blind children. It is also said that he often wept while he worked. Old temple pilgrimage. 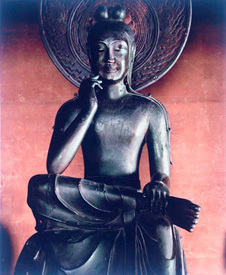 The book contains nearly 180 images of temples and Buddhist images in Kyoto and Nara.